Rinkujutsu shared this tutorial explaining the build of the base of their fantastic Legend of Zelda Twilight Princess Master Sword. 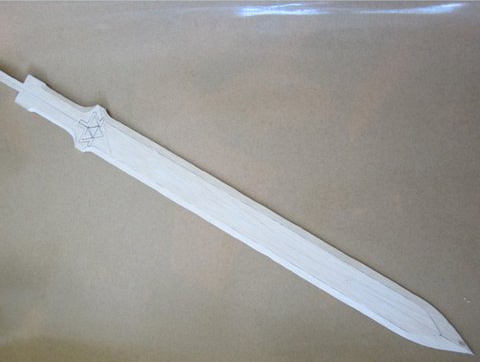 This tutorial is for creating a lightweight but sturdy prop sword blade from reinforced balsa wood covered with Worbla. I have only tried this with a four foot long blade, so I don’t know how it would work with longer lengths. Note: This is for creating just the blade and is NOT a full step-by-step Master Sword tutorial. 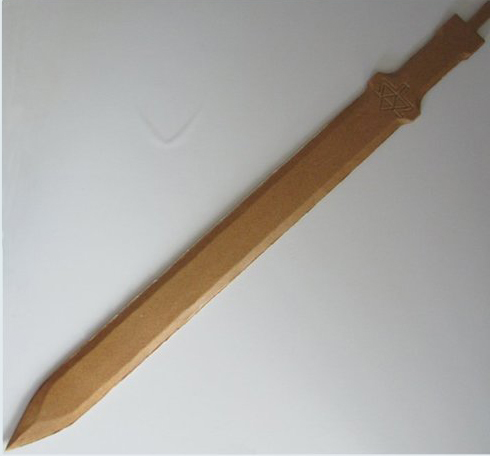 – Worbla, about 1/4 of a jumbo sheet or more depending on the width of your sword blade. – Xacto blades: standard tip and 1/2 wide chisel type tip. Note, if your blade is going to be under three feet long, skip to step 7. Step 2: Cut the sheet in half through the diagonal line of your Xacto knife. 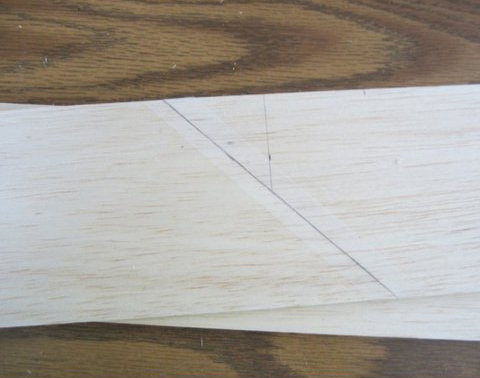 Step 3: Grab your last two balsa sheets and draw a 45 degree angle line on one end of each of them. Step 4: Cut off the little end triangles on the diagonal line. Step 5: Take one of the longer sections and pair it up with one of the shorter sections to create what looks like a longer plank with a seam. You will have two groups of these. Use a strip of tape to temporarily hold the seam in place. It will be strong enough to hold until you glue it. You should now have two layers of balsa wood sheets. We will be inserting a metal rod between them and laminating them together. 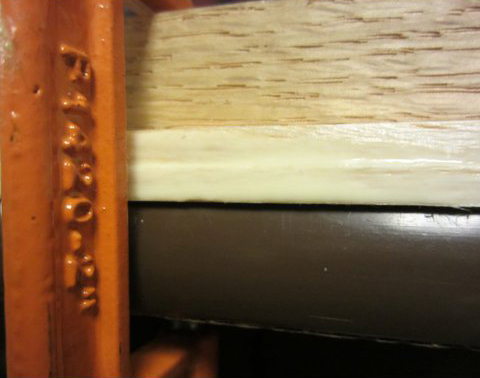 When picking the balsa wood sheets, select ones that are as flat as possible so that they will fit snugly together. Step 7: Get your flat metal rod out since it’s time to cut a slot for it. 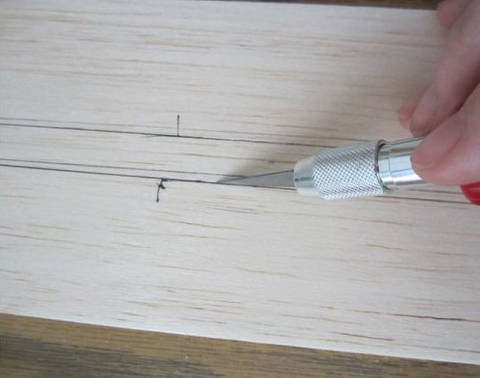 Step 9: Use your Xacto knife to gently score each of the lines that are 1/4″ away from the center. 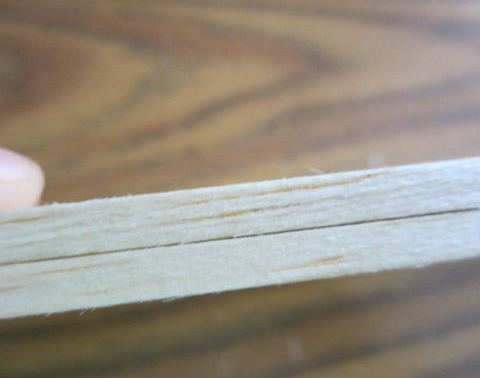 Be careful to only cut no more than halfway through the balsa. 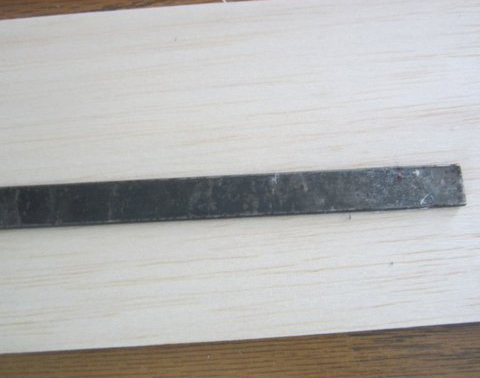 It’s very easy to by accident cut through the entire plank. 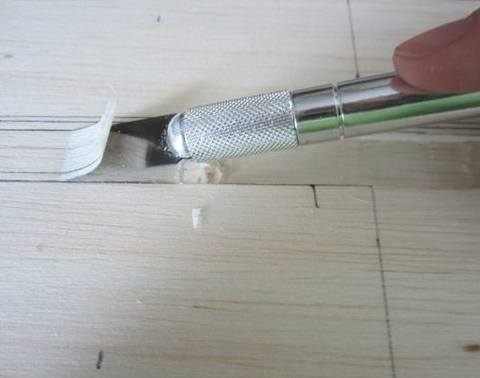 Step 10: Use the 1/2″ Xacto knife chisel tip to cut a groove between the two lines about 1/16″ deep. 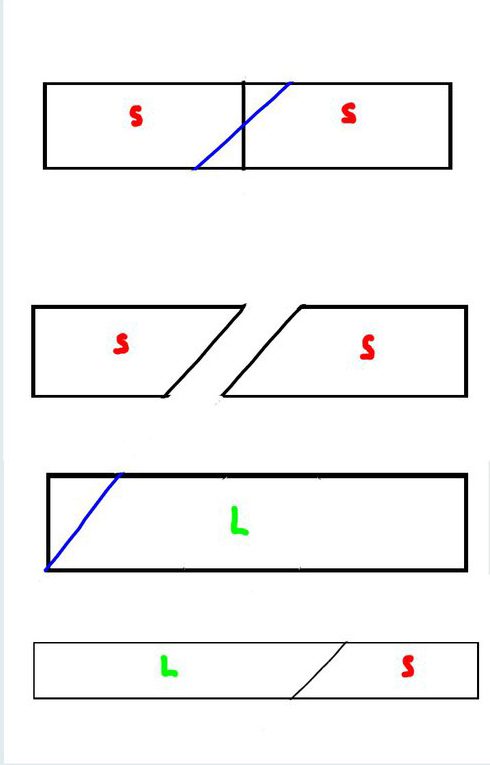 Do this on both blanks. you’ll know it’s deep enough when the metal rod fits in it snugly without too much extra room. Note: Don’t cut the groove all the way from end to end. Start several inches in from the end so that the tip of the sword won’t have an empty hole in it. I forgot about this and it posed some problems once I started carving the tip of the sword. Step 11: Use your brush to slap on a layer of wood glue on both blanks on the side that has the groove for the metal rod. Insert the metal rod and press both layers together. 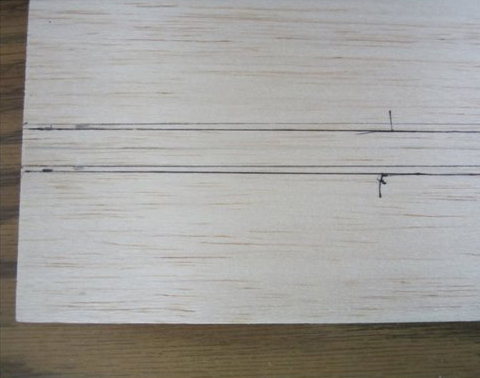 Clamp it to a table top with a flat wood blank on top to prevent the clamps from marring the balsa wood. You can also clamp it between two wooden planks. Let it dry overnight. 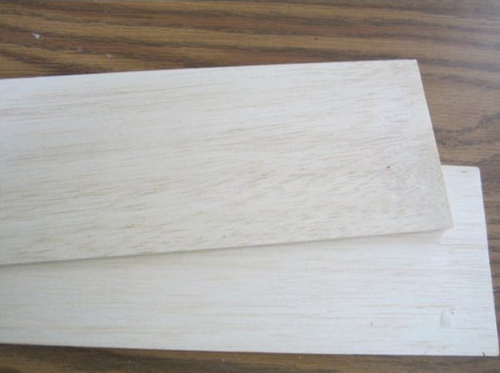 Step 12: You will now have a reinforced and laminated balsa wood plank to use for your sword blade! Get out your sword blade patterns, trace them on, and cut out and carve the blade with your Xacto knife. Balsa is extremely easy to carve; it only took me about 20-30 minutes to shape the Master Sword blade. For the engraved sections like the triforce on the blade, just press hard with a blunt tool on the design and it will easily leave an impression in the balsa wood. 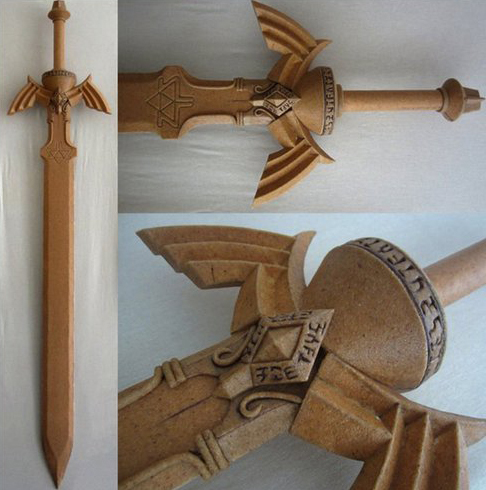 Step 13: Sandwich your entire blade in Worbla! Balsa is too weak on its own, so this step is necessary. I didn’t take pictures of this step since it is no different than sandwiching craft foam pieces in Worbla. I suggest working from the tip of the sword to the bottom, heating only a few inches at a time, and sandwiching that section before moving on another few inches. for the engraved sections, just press the Worbla down into the impressions to create an embossed effect. You’ll notice that my trimmed edges are rough. I fixed this by taping sandpaper to a flat board and sanding the edges down until they were flat. That’s it for this tutorial! Go ahead and build the rest of your awesome sword and show it to me when you are done :D ! I am not able to make a step-by-step tutorial on my TP Master Sword because of my lack of progress picture, but I will be doing tutorials on the other techniques that I used to make it. I hope this tutorial was helpful and let me know what other tutorials you would like to see! With many thanks to Rinkujutsu for sharing this with us!